Those who are OK with the softer, mellower Nirvana sound should have no complaints with Unplugged In New York , as the sound and picture quality are excellent. Those desiring the harder Nirvana sound should check out Live! Tonight! Sold Out! ; however, the DVD has its issues. It is a fairly messy compilation and many of the videos are edited into each other, an annoyance for most fans of live performance material. From the band's infamous 1992 concert, the Nirvana - At Reading Festival DVD has been reviewed positively. Their full 1992 SNL appearance can be found in trading circles. 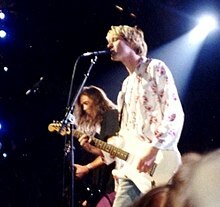 In the late 1980s, Nirvana established itself as part of the Seattle grunge scene, releasing its first album, Bleach, for the independent record label Sub Pop in 1989. They developed a sound that relied on dynamic contrasts, often between quiet verses and loud, heavy choruses. 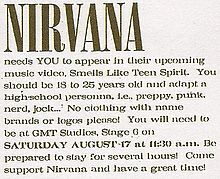 After signing to major label DGC Records, Nirvana found unexpected success with "Smells Like Teen Spirit", the first single from the band's second album Nevermind (1991). Nirvana's sudden success widely popularized alternative rock, and Cobain found himself referred to in the media as the "spokesman of a generation", with Nirvana considered the "flagship band" of Generation X. Nirvana's third studio album, In Utero (1993), released to critical acclaim, featured an abrasive, less mainstream sound and challenged the group's audience. ^ Azerrad, Michael. "Inside the Heart and Mind of Nirvana". Rolling Stone. April 16, 1992. Archived from the original on January 9, 2008. Retrieved August 23, 2010. ^ Gupta, Rapti (December 17, 2013). "Nirvana to be Inducted to the Rock Hall of Fame in 2014". International Business Times. Retrieved May 17, 2014. ^ a b "Top Selling Artists". Recording Industry Association of America. Retrieved March 7, 2012. ^ Fricke, David. "Krist Novoselic". Rolling Stone. September 13, 2001. ^ Young, Charles; O'Donnell, Kevin. "Nirvana: Album guide". Rolling Stone. April 11, 2010. Retrieved February 21, 2011. ^ Price, David J. Nirvana's 'Bleach' Turns 20, New Live Recording Coming. Billboard. August 4, 2009. Retrieved January 28, 2011. According to the source, Bleach has now sold 1.7 million copies in the United States. ^ Wice, Nathaniel. "How Nirvana Made It". Spin. April 1993. ^ "Nirvana Achieves Chart Perfection!" Billboard. January 25, 1992. ^ a b Basham, David. "Got Charts? No Doubt's Christmas Gift; Nirvana Ain't No Beatles". MTV.com. December 20, 2001. Retrieved August 20, 2011. ^ "Nirvana's 'Nevermind' To Be Re-Released". Billboard.com. June 27, 2011. Retrieved January 12, 2012. ^ "Nirvana's Reading Festival gig to be released on DVD". NME. April 20, 2009. Retrieved August 23, 2010. ^ "Nirvana headline Reading Festival". BBC Online. Retrieved August 23, 2010. ^ a b c d e Gaar, Gillian G. "Verse Chorus Verse: The Recording History of Nirvana". Goldmine. February 14, 1997. ^ a b c d Fricke, David. "Kurt Cobain: The Rolling Stone Interview". Rolling Stone. January 27, 1994. ^ "In Numero Uno". Entertainment Weekly. October 8, 1993. Retrieved August 23, 2010. ^ Farley, Christopher John. "To The End Of Grunge". Time. September 20, 1993. Retrieved August 23, 2010. ^ "FEATURE: Jad Fair: The Half Japanese interview | Features". Caught in the Crossfire. 2014-11-28. Retrieved 2016-03-14. ^ Di Perna, Alan. "Behind Unplugged". Guitar World. March 1995. ^ Sanz, Cynthia. "Hardly Nirvana". People. March 21, 1994. Retrieved October 2, 2010. ^ Heard, Chris. "Torment of rock hero Cobain". BBC News. April 6, 2004. Retrieved August 22, 2010. ^ Ali, Lorraine. "One Last Blast". Rolling Stone. October 17, 1996. ^ Pareles, Jon. "Rookies' Win Big in the 38th Grammy Awards". The New York Times. February 29, 1996. Retrieved December 3, 2010. ^ a b Heath, Chris. "The Nirvana Wars: Who Owns Kurt Cobain?". Rolling Stone. June 6, 2002. ^ Stout, Gene. "Courtney Love, former members of Nirvana settle suit". September 30, 2002. Seattle Post-Intelligencer. Retrieved July 19, 2011. ^ Susman, Gary. "'Mile' Marker". Entertainment Weekly. November 7, 2002. Retrieved November 14, 2010. ^ "Track List Set For Nirvana Compilation". Billboard. September 20, 2005. Retrieved November 14, 2010. ^ Vineyard, Jennifer. "Courtney Love Sells Substantial Share Of Nirvana Publishing Rights". MTVNews.com. April 13, 2006. Retrieved September 5, 2007. ^ Cohen, Jonathan. "Nirvana Concert Film Making DVD Debut". Billboard. October 3, 2006. Archived from the original on October 21, 2007. Retrieved August 24, 2010. ^ Cohen, Jonathan. "Nirvana's 'Unplugged' Finally Heading To DVD". Billboard. October 4, 2007. Archived from the original on April 30, 2008. Retrieved August 24, 2010. ^ "Nirvana 'Live At Reading Festival' DVD finally set for official release". NME. September 3, 2009. Retrieved August 24, 2010. ^ Breihan, Tom. "Sub Pop to Reissue Nirvana's Bleach". Pitchfork Media. August 14, 2009. Retrieved November 27, 2010. ^ "Details of Nirvana's Nevermind Reissue". UpVenue.com. Retrieved May 19, 2013. ^ Kreps, Daniel (August 13, 2013). "Inside Nirvana's Rarities-Packed 'In Utero' Reissue: Demos, Live Cuts, and a Found Track | Music News | Rolling Stone". Retrieved August 23, 2013. ^ "Paul McCartney to replace Kurt Cobain in Nirvana reunion". Guardian.co.uk. December 12, 2012. Retrieved on December 12, 2012. ^ "Nirvana Reunites with Paul McCartney, Record New Song 'Cut Me Some Slack'". Consequence of Sound. December 12, 2012. Retrieved December 12, 2012. ^ Erlewine, Stephen. "Sound City: Real to Reel - Original Soundtrack". AllMusic. Rovi Corporation. Retrieved March 26, 2013. ^ Vozick-Levinson, Simon (July 22, 2013). "Paul McCartney on Playing With Nirvana's Surviving Members". Rolling Stone. Retrieved January 27, 2014. ^ "Paul McCartney at Safeco Field". Seattle Post-Intelligencer. July 20, 2013. Retrieved July 20, 2013. ^ "NME News Krist Novoselic says female-fronted Nirvana shows 'conjured spirit of the band'". Nme.com. 2014-04-14. Retrieved 2015-04-23. ^ "Krist Novoselić on Twitter: "Thank you @joanjett @lordemusic @KimletGordon @st_vincent for joining @nirvana tonight".". Twitter.com. 2014-04-10. Retrieved 2015-04-23. ^ "The Inside Story of Nirvana's One-Night-Only Reunion at the Rock and Roll Hall of Fame". Rolling Stone. April 16, 2014. Retrieved October 26, 2014. ^ Siegel, Jacob (April 12, 2014). "He Left Nirvana Because He Had Cooler Things to Do. Like Going to Iraq.". ^ "Beck Fronts the Surviving Members of Nirvana on "The Man Who Sold the World" : Blogs". Relix.com. 2016-02-16. Retrieved 2016-03-14. ^ a b Chappell, Jon. "Nirvana's music". Guitar. June 1993. ^ Kanter, L.A. "Kurt Cobain's Well-Tempered Tantrums". Guitar Player. February 1992. ^ Nirvana Rare Full Interview 1993 [url=https://www.youtube.com/watch?v=1rhotCKLwcQ&t=1m57s] Seattle, August 10, 1993. Retrieved May 13, 2014. ^ di Perna, Alan. "Nevermore". Guitar World. March 1999. ^ Cross, Charles R. "Requiem for a Dream". Guitar World. October 2001. ^ Gilbert, Jeff. "Cheap Tricks". Guitar World. February 1992. ^ Classic Albums—Nirvana: Nevermind [DVD]. Isis Productions, 2004. ^ True, Everett. "Seattle: Rock City." Melody Maker. March 18, 1989. ^ a b di Perna, Alan. "The Making of Nevermind". Guitar World. Fall 1996. ^ Robb, John. "White Heat". Sounds. October 21, 1989. ^ Steinke, Darcey. "Smashing Their Heads on That Punk Rock". Spin. October 1993. ^ Erlewine, Stephen Thomas. "Nirvana Artist Biography". AllMusic. Retrieved October 21, 2013. ^ a b Olsen, Eric. "10 years later, Cobain lives on in his music". MSNBC.com. Retrieved October 19, 2010. ^ a b Erlewine, Stephen Thomas. American Alternative Rock/Post-Punk. Allmusic.com. Retrieved January 18, 2011. ^ Pareles, Jon. "Pop View; Nirvana-bes Awaiting Fame's Call". The New York Times. June 14, 1992. Retrieved January 17, 2011. ^ Rich, Frank. "Journal - Far From Nirvana". The New York Times. April 14, 1994. Retrieved January 17, 2011. ^ "The Mojo Hall of Fame 100" (120 - 10th Anniversary Issue). Mojo magazine. November 2003. ISSN 1351-0193. ^ "First stars in music Hall of Fame". BBC. November 12, 2004. Retrieved October 22, 2013. ^ "Rolling Stone: The Immortals: 100 Greatest Artists of All-Time". Rock On The Net. 2004. Retrieved October 3, 2013. ^ Pop, Iggy. "100 Greatest Artists: Nirvana". Rolling Stone. 2011. Retrieved October 3, 2013. ^ "100 Greatest Guitarists: David Fricke's Picks: Kurt Cobain". Rolling Stone. 2003. Retrieved October 21, 2013. ^ "100 Greatest Singers: Kurt Cobain". Rolling Stone. November 27, 2008. Retrieved October 4, 2013. ^ "100 Greatest Guitarists: Kurt Cobain". Rolling Stone. November 24, 2011. Retrieved October 4, 2013. ^ "VH1: 100 Greatest Artists of Rock & Roll". Rock On The Net. 1998. Retrieved October 3, 2013. ^ "VH1: '100 Greatest Hard Rock Artists': 1-50". Rock On The Net. 2000. Retrieved October 7, 2013. ^ "VH1 100 Greatest Artists Of All Time". Stereogum. September 3, 2010. Retrieved October 3, 2013. ^ "Definitive 200 Albums". Rock and Roll Hall of Fame. 2007. Archived from the original on 2007-04-10. Retrieved October 23, 2013. ^ MTV News staff (April 6, 2005). "For The Record: Quick News On Gwen Stefani, Pharrell Williams, Ciara, 'Dimebag' Darrell, Nirvana, Shins & More". MTV. Retrieved October 22, 2013. ^ Tyrangiel, Josh (November 13, 2006). "All-TIME 100 Albums: Nevermind". Time. Retrieved October 21, 2013. ^ Suddath, Claire (October 21, 2011). "All-TIME 100 Songs: 'Smells Like Teen Spirit'". Time. Retrieved October 21, 2013. ^ "30 All-TIME Best Music Videos: 'Heart-Shaped Box'". Time. July 26, 2011. Retrieved October 21, 2013. ^ "Nirvana Awards". AllMusic. Retrieved October 21, 2013. ^ "Gold & Platinum database search: 'Nirvana'". Recording Industry Association of America. Retrieved October 23, 2013. ^ "Certified Awards" Archived February 6, 2013, at WebCite. British Phonographic Industry. Retrieved October 23, 2013. Note: In the "Search by parameters" section, user needs to (1) enter "Nirvana" in the "Keywords" field and (2) tick the "Exact match" box then (3) click the "Search" button. ^ Maloy, Sarah. "Nirvana's 'Nevermind' 20th Anniversary Editions Include Unreleased Recordings, Alternate Mixes, More". Billboard. July 26, 2011. Retrieved October 23, 2013. ^ "On This Day: 1994: Rock musician Kurt Cobain 'shoots himself'". BBC. April 8, 1994. Retrieved October 23, 2013. ^ Darren Levin (March 18, 2014). "Nirvana drummer dumped from Hall Of Fame via brutal SMS". Faster Louder. Faster Louder Pty Ltd. Retrieved March 22, 2014. Nirvana is not currently on tour.